It's important to take periodic breaks from high-intensity training throughout the year in order to fully recharge your muscles and your motivation. During these off periods you may wish to expand your life experience with activities such as music or martial arts. ow that you ve adopted solid fundamentals for your training routine and been introduced to several varieties of techniques, we can look toward the high-intensity training that will produce the most significant results. First, though, to make sure you have the level of dedication required to attain your goals, we must address one of the biggest obstacles to proper training: boredom. Many of us become bored with training. You're no doubt familiar with the feeling: you know that you should train, and yet, just the thought of training seems to fill you with inertia. This is a normal psychological response to a redundant stimulus. We all know that from boredom does not proceed motivation, and without motivation you cannot train in a high-intensity fashion. If you cannot train in a high-intensity fashion, you will never progress toward your goals of muscular growth and bodily perfection. So, how does one stave off the eventuality of lethargy in one's training career? The answer is subtle, though dramatic in its impact: simply alter your routine from month to month. Nothing major is required, just marginal variations on the same high-intensity theme. How does one perform these subtle variations? The answer to that query is through monthly specialization. Since boredom and overtraining march in lockstep, we prevent one by preventing the other—while at the same time stimulating almost unbelievable growth in select body-parts every month. The key to year-round training and, more important, year-round results is specialization. Select one bodypart to be specialized on per month, making sure to include all bodyparts throughout any twelve-month period. Keep your sets for the targeted bodypart to a maximum of five in order to maintain an adequate degree of intensity for growth inducement. Any more sets than this will require you to reduce your intensity levels in order to complete them—a step in the wrong direction if your objective is a muscular mass increase. Also, perform only one set, maximum, for the remainder of your bodyparts. 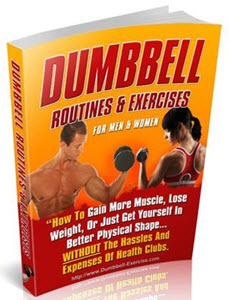 This will instill a degree of intensity sufficient to induce overall growth of the body's muscular systems, will be sufficiently brief to prevent overtraining, and will be sufficiently diverse to prevent you from falling into the doldrums of boredom. 1. Never work out more than three times per week; often, working out twice in a week will produce better results. 2. Train your whole body in each session. 3. Never perform more than twelve sets in any given workout. Intermediates should perform only ten total sets in any given workout. 4. When specializing, beginners should perform only five sets for the bodypart being specialized on, with each set being a legitimate "all-out" effort. 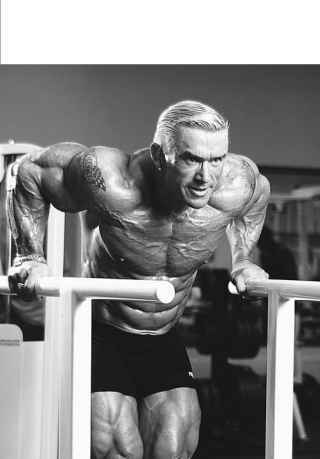 Intermediates should reduce their sets for the targeted muscle group to a maximum of three. 5. Work the specialized bodypart first in the routine, when your energy level is highest, and then train your other bodyparts in descending order—from the largest to the smallest. 6. Perform negatives on your last workout of the week (i.e., on Friday's workout). 7. Take one full week off from weight training every ten weeks. 8. When not specializing, use the basic routine described in this chapter for impressive, balanced muscular growth. 9. When specializing, select a different bodypart every month. 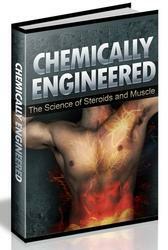 This imparts balanced development and prevents overtraining of a muscle group. This schedule should serve you as a guide in setting up your own training blueprint for the coming year. It is important to take one full week off after every ten weeks of high-intensity training. 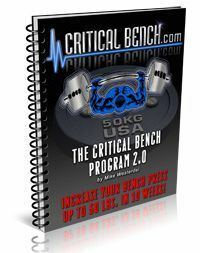 This will help to keep both your enthusiasm and energy reserves primed to a high degree, thus defeating the demons of boredom and overtraining that always rear their objective-defeating heads around the ten-week mark. Once a week, perform all of your exercises in a negative-only fashion. Negatives as a method for doing chin-ups were cited in Chapter 8. Negatives require you to perform exercises with 40 percent more weight than you normally would use and have your training partner (or partners, depending upon your strength level and the amount of weight you will be using) lift the weight to the top while you concentrate on lowering it, taking at least eight seconds to lower the resistance back to the starting position. Continue lowering the resistance until you can no longer control the descent of the weight, as when it now descends in two seconds as opposed to the initial eight. Also keep in mind that during your "week off" you should be performing some form of aerobic activity in order to burn calories and prevent the expansion of your body's fat cells. Any activity you choose should be of very low intensity and somewhat enjoyable, such as jogging, distance walking, badminton, swimming, dance, martial arts, or bicycling. Because of the lower intensity of these activities, you will not make major inroads into your body's recuperative subsystems, thereby leaving them ample time to build up in anticipation of the following week's assaults, and the activities will burn up calories that would otherwise be stored as adipose. The formula might appear as follows: ten weeks of all-out training with emphasis on a particular bodypart to build size, and one week of endurance or aerobic training to "rip up." If you couple this program with a balanced, calorie-reduced diet, you will look and feel better than you ever have before. 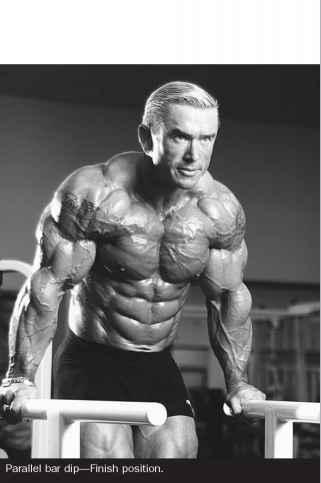 When you think about it, that is why we started bodybuilding, isn't it? And now, let's get started with month one. We can deduce from the foregoing information that our ideal baseline routine should be intense (and, ipso facto, brief) enough to stimulate muscular growth and infrequent enough to allow for growth to take place once it has been stimulated. Ergo, the three-day-per-week system of training. What follows, then, is a whole-body, year-round routine. In the coming months, we will get into specialization on various bodyparts, should you feel so inclined, that will produce stunning gains in muscular body weight. If you crave variety in order to keep motivated, or if certain bodyparts begin to lag, you can rely on the following chapters for advice on how to overcome these obstacles to continuous muscular progress. Until the mid-1980s nobody knew with any degree of certainty how many repetitions an individual should perform in a given exercise to facilitate maximum growth of specific muscle groups. "Do five repetitions for bulk" was a common statement, although an invalid one, as we shall see; or "You've got to do twenty repetitions in the squat to make any gains from the movement whatsoever." These statements and thousands like them have been shown to be absurd in light of a major physiological discovery revealed in 1986 by Arthur Jones, of Nautilus Sports/ Medical Industries. Use of the then supremely sophisticated Nautilus medical machines (later used as the template for the MedX line of rehabilitation equipment) revealed that, in terms of repetitions, what works for one individual may not necessarily work for another. Not only does each individual have specific repetition requirements, but each of the individual's muscle groups might as well. For instance, one individual may need to perform only five repetitions in the squat to thoroughly stimulate the leg muscles into maximum growth, whereas five repetitions for another individual may do nothing in the way of stimulating growth because the repetitions were inadequate for making any meaningful inroad into the muscular reserves. percent mark with a low number of repetitions; these people will have a high neuromuscular efficiency. Others will not be able to make a 20 percent inroad with anything less than perhaps fifteen to twenty repetitions; they will have a low level of neuro-muscular efficiency. Therefore, it is obvious that no one can tell you, as an individual, how many repetitions you should be doing to stimulate maximum growth. People can tell you, as I have, what the ideal percentage of inroad is, but short of determining through individual analysis what your individual specific repetitions (I.S.R.) range per muscle group is, they can tell you no more. That leads to the question of how to determine what one's "ideal repetition range" per muscle group is. Fortunately, you don't have to sell your house in order to afford a series of MedX or Nautilus medical machines to obtain the answer to your muscular queries. The solution lies in the method born of the technology and not in the technology itself. The following four-step procedure can help you arrive at the ideal repetition range for each muscle group. 80 percent of that one-rep-max weight. For example, if your one-rep max on the bench press is 200 pounds, 80 percent is 160. 2. Multiply the number of repetitions you perform by .15, and round off the result to the nearest whole number. So, if you get six reps, it's 6 X .15 = 0.9, or 1. 3. Add the number you have just calculated to the number of repetitions that you were able to perform. In this case, 1 + 6 = 7 repetitions. That number becomes the high end of the rep range—that is, the number of reps for which you should shoot before increasing your resistance by 5 percent. 4. Subtract that same number, 1, from the number of repetitions you were able to perform—that is, 6 - 1 = 5. That's now the low end of your rep range for this particular muscle group—that is, the minimum, or starting, number of repetitions for which you should shoot to stimulate a 20 percent inroad into your muscular reserves. By this simple procedure, you can now determine the ideal repetition range for each particular muscle group to be trained (e.g., chest: five to seven repetitions). Repeat this method for all remaining muscle groups to determine their "ideal" repetition range, and then apply the resulting information to the following routine for maximum results. Warm up: Do one to five minutes of deep knee bends, stretching, mild exercise, or stationary bike—the purpose of which is to reduce viscosity to the joints, the knee in particular, so that there is no resulting trauma to the joints when you commence with the routine. second repetition and so on until you have completed your set. 2. Lat pull-downs: Grab the lat pull-down bar with a palms-under grip, so your arms are fully extended above your head. Slowly contract your lats by pulling the bar down to your chest. Hold this position of full muscular contraction for a two-count before allowing the weight to return in four seconds back to the starting position. 3. Dumbbell bench presses: To perform the exercise properly, lie on a bench with two dumbbells at arm's length over your chest. Slowly lower the dumbbells to your upper chest. Once the dumbbells have touched your chest, slowly press them back up to the top position, and repeat the procedure for the required number of repetitions. Put the weights down, rest briefly, and then perform your next exercise. 4. 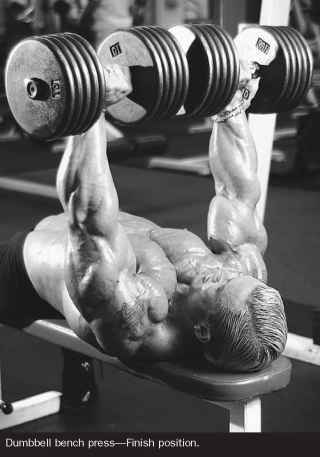 Shoulder presses: This exercise can be performed with a barbell, dumbbells, or with a machine. In order to perform this exercise properly, you should clean (remember our definitions section in the Chapter 1) the barbell to your upper chest, or to the front of your shoulders. Then, slowly press the weight upward until your arms are fully extended over your head. Slowly lower the resistance back down to your shoulders (the starting position), and repeat the procedure for the required number of repetitions. Rest briefly, and then move on to your next exercise. 5. Standing barbell curls: Stand erect with a shoulder-width grip on the barbell and your palms facing front. Your arms should be fully extended so that the barbell is directly in front of your thighs. Slowly curl the barbell up to shoulder height, solely using the muscles of the upper arm by bending the elbows. From this fully contracted position, slowly lower the resistance back to the fully extended (or starting) position. Repeat for the required number of repetitions, and then rest briefly before performing your next exercise. Remember to let only the upper arms do the work during this movement. 6. Parallel bar dips: Stand between two parallel bars. Place your hands on the bars and slowly press yourself upward with your arms locked out. Now slowly lower yourself by bending your arms until you are as low as you can descend. Repeat for your I.S.R. your repetition framework. It is not a lot of work, but the object is not to see how much exercise your body can stand; that would be endurance training and not strength training. The goal is to see how little exercise is required to stimulate maximum muscle growth. Perform all of your exercises slowly. As I have instructed throughout this book, lift the weight in two seconds and lower it in four. Hold the fully contracted position for a two-count before you begin to lower the weight. Also make sure that your form is immaculate—exaggeratedly so, in fact. This will place more tension on the muscles and thereby raise the intensity of the exercise, which is a step in the right direction. This high-intensity routine should be performed in less than forty-five minutes. Every time you are able to reach the upper guide number of repetitions in good form, increase the weight by 5 percent and aim for that guide number of repetitions once again. That, in its brevity, is the routine. It is brief, but it is so of necessity. You do not need more exercise than this to stimulate maximum gains in muscular mass. If you are drastically underweight, this routine coupled with a high-calorie diet should put on up to twenty pounds in one month. If you are an intermediate, you can expect to increase your muscular bodyweight by a minimum of eight pounds. Remember that the closer you are to a "normal" weight for your height, the slower the acquisition of muscular body weight will be. If you have been following the routines in this book on a monthly progression from the first chapter, or if you've decided to jump into the program here and were previously using a different training system, I advise taking a solid week off from training in order to recover. Then resume this program three times per week and expect to gain muscular mass at a rate so unprecedented that you may be floored. In time, when you have effectively doubled your strength on this program, only two weekly workouts will be required, and later, only one weekly workout. The reason is that your ability to generate intensity will become so great that you will require those additional days off to merely recover, and then more time still in order to grow. (Remember the three-phase nature of the muscle-growth process.) This isn't the exclusive domain of the Arnold Schwarzeneggers of this world. When Arnold doubles his strength, he may well be capable of lifting a small apartment building, but that doesn't mean that until you are capable of similar feats you should continue to work out three days per week. Strength is a purely relative attribute. Sure, Arnold could out-bench-press me any day of the week, but then power lifters such as Ed Coan or Bill Kazmier could out-bench Arnold any minute of the day. As soon as you have doubled your strength, it is time for a reduction in workout frequency. This basic program will serve you well for the rest of your training life. It will produce significant results and will save you from wasting considerable time as well. I mentioned at the beginning of this book that the champions of today are champions because of heredity. If you have similar potential, this routine will realize it. If you do not, no routine will make you a champion, but the goal to realize your fullest potential remains the same. In any event, potential being the expression of possibility, you will never know if you are capable of developing a physique of Mr. Olympia proportions unless you make the attempt. I am planning to start this routine but there is one thing I'm not quite sure. Do I use 80% of my 1RM throughout the routine?